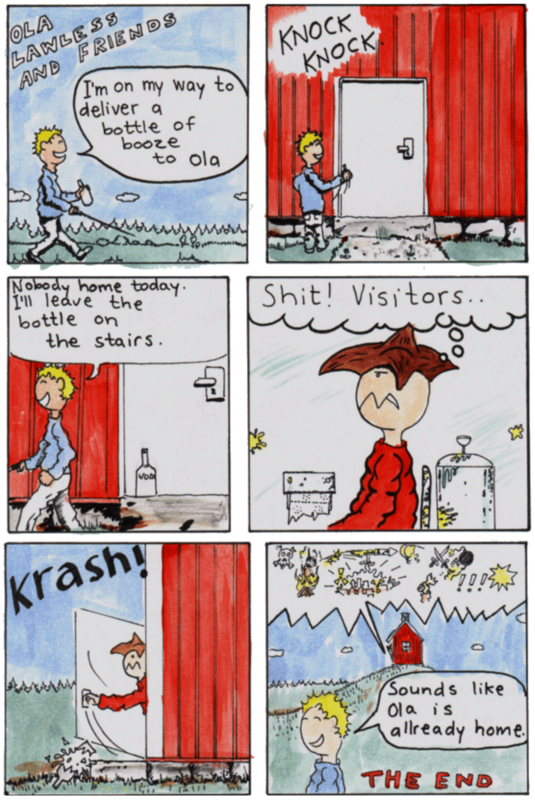 Ola Lawless and Friends - A hand-drawn web comic. This is Ola Lawless and friends, A hand-drawn web comic about Ola and his friends. In today's comic:Ola Lawless and Torgny. 20100328's comic:Blind Daves booze delivery service. This is the main page where you can read the latest comic. This is where you can read the latest news about Ola and his friends. This is where you go to read previously published comics and to look at various artwork related to the comic. This is where you can learn more about the characters staring in the comic. This is where you can learn more details about the comic. This is where you can donate your money to something better than all the usual junk you spend it on. This is where you send your thanks or hate mail. Or just get in touch in general. This is where we keep links to other websites and also vote buttons for different webcomic lists. Please vote for us every day to keep Ola happy!